Suitable for intermediate knitters, but a good project for knitters who have mastered knit-and-purl and want something more. 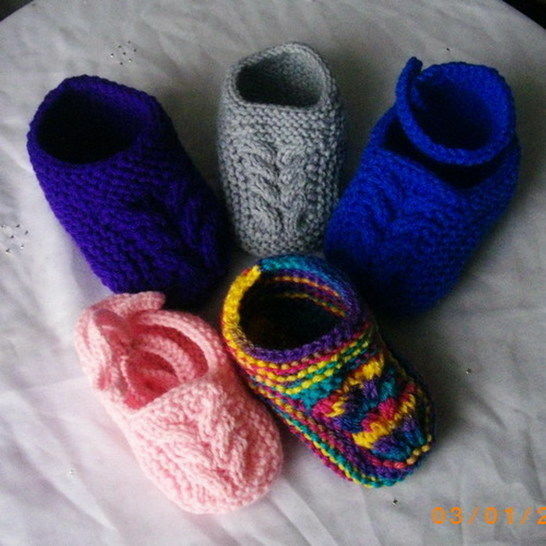 These little slippers are fun to make – one piece with shaping!. There is the ballet style with long ties, to which you may of course attach ribbon instead of the knitted cord; the ankle-strap with button fastening; and the bootee-style. They use such a small amount of yarn and are quick to knit up - your little one can have a whole range of colours! Because these are mostly garter stitch, the fabric of the slipper will be nice and stretchy, so the heel-to-toe measurements below are approximate: First size: 4.5” Second size: 5” Third size: 5.5” There are five pages to the pattern, with written instructions and photographs. Worsted yarn was used for all the slipperes, but you don't need to use the yarn specified as long as you make sure that you check the gauge. The slippers are nit flat, so only straight needles are required.